I made this “live action” music video on Sunday! It’s my first attempt at something like this. The cosplayer’s name is Mindy Mica and she was kind enough to spare some time for this shoot. There was an event at Klang Parade and I noticed Christmas decorations were up so I thought of making a festive themed one. The song is Jingle Bells ga Tomaranai – the new Aqours collaboration song with the School Idol Festival mobile game. There was a snowglobe thing which had air pumped inside to inflate it into a spherical shape at the mall, this was where most of the “snow” scenes were done. You can actually go inside, it’s RM 5 per pax and you can probably fit 3-4 people in there. The rest was filmed around the mall. This is one of those by-fans-for-fans things, it’s content I like to see as a Love Liver so I thought of producing some to put out there too. Yeah, I was pretty surprised to hear about it too. It was posted by a fellow Love Liver earlier today so I immediately drove down to Avenue K to check it out. I later found out that the gashapon machines were brought in by Shojikiya. 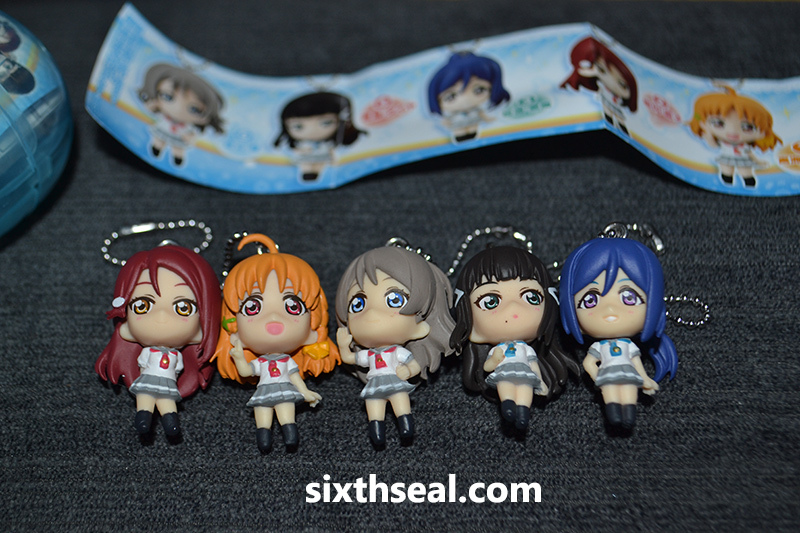 It’s one of those dangly things which you can hang on stuff – the available characters are Chika, You, Riko, Dia and Kanan. Each roll is RM 15 (RM 5 tokens x 3) – if you’re not familiar with gashapon machines, they are novelties or collectibles stored in a plastic “egg” which is then cranked out of a machine. What comes out is random, you can’t choose the one you want, so it adds an element of chance (and gets collectors to spend more). I wanted to get 1 of each girl but my limit was RM 150, which gives me 10 attempts. I did manage to get one of each but it took me till the 9th try (RM 135) to get Riko. I also had a brain fart and kept on referring to her as Ruby in the video. To be fair, she has a similar hair color but as a Love Live fan, I shouldn’t have made the mistake in the first place. Oh well. It did give me a chance to try out moving text though. I want to challenge myself to add a new effect that I learned into each video or make it better somehow. I’ve also been trying to add a lot of energy but I think this is a bit too much. Haha. I was actually quite hyped up and on a lot of caffeine since I was about to start my daily torture exercise regime before I rushed down for this. I know, it’s early. 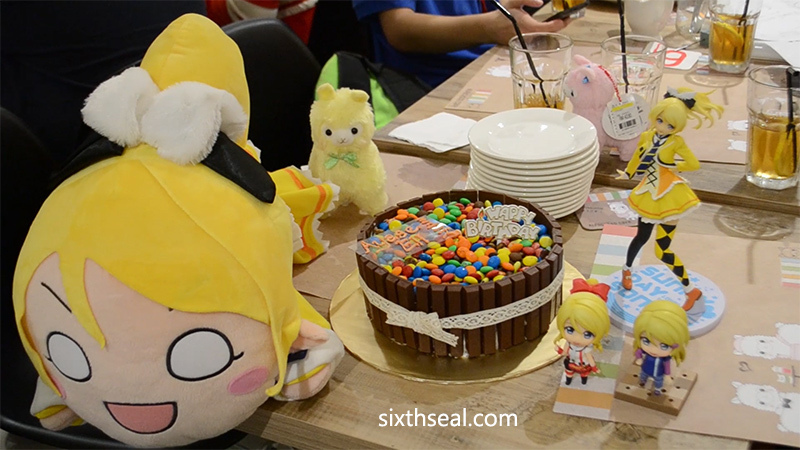 Elichika’s birthday is actually on the 21st of October but the Malaysian Love Livers celebrated it early last Sunday at Alpacasso Cafe @ AEON, Midvalley. I’ve always seen people on reddit celebrating various waifu birthdays and I thought it sounded like a lot of fun. I’ve just never seen any locally until I met Anson via the COSFAIR event where I filmed the MilkyWay girls. It might sound strange to celebrate a 2D anime character’s birthday but it’s actually a lot of fun to hang out with like-minded people and share something we’re all interested in. I think the fellowship comes first, the character’s birthday is just the pretext of meeting up. That’s the best way I can explain it to someone who doesn’t understand why people do this. I’ve never quite gotten into Eli Ayase (the character) but I do like the seiyuu (voice actress). Nanjou is one of my two “best girls” (an anime term denoting your favorite) – the other being Pile (voicing Maki). I even started listening to fripside lately, the songs for A Certain Scientific Railgun are pretty good. I just finished editing and putting together subtitles for the video of Eli’s birthday celebrations with the Malaysian Love Livers. I know my Chinese isn’t very good, and some of you might be surprised to learn that Mandarin is in fact my first language – I just can’t read or write. I also can’t speak it very well especially when people start using harder words so the subtitles might not be 100% accurate. I’m a little puzzled why I don’t understand the harder words too since I spoke Mandarin until I went to New Zealand to do high school at 15. 15 years is a long time to pick up a language! I think it’s mostly coz I never immersed myself in Chinese culture – I don’t listen to Chinese songs etc so I never had any reason to go beyond simple conversational use. I still wanted to do the narration in Chinese though coz I like the idea of bilingual videos. However, I encourage you to turn on CC for English subtitles since they’re probably more accurate and conveys what I mean better. I wrote the text in English first before attempting to translate it verbally into spoken Mandarin and needless to say, it took a lot of takes. Someone even brought a Kit Kat + M&M custom made cake for Eli’s birthday! We were the ones to eat it though. Haha. Yes, I’m calling it a documentary coz I’m being pretentious and I spent 12 hours editing it. I was actually quite lucky coz I never read my emails (sorry guys but it’s true). It just so happened that I couldn’t sleep (see previous post) so I was going through all my stuff and I found a flyer about a cosplay event by Evolve Mall. I went to the event page and came across a promo video featuring the MilkyWay girls. I thought it was really good. I’ve been watching a lot of cosplay dance covers by Love Live groups coz I want to make my own and also to improve my video editing skills. I creeped on the MilkyWay posts and found a girl called Vicky, who turned out to be one of the leaders. I messaged her the night before (yesterday) and asked if I could tag along and film them, not just their performance, but also shadow them and eat with them and interview them. I gave her my number and she said she’ll discuss it with the other group members and got back to me 20 minutes later saying it was okay with everyone. Thus, I went there this morning to film them. They actually had two performances but I only managed to get the first one since I had to leave at 3 pm. 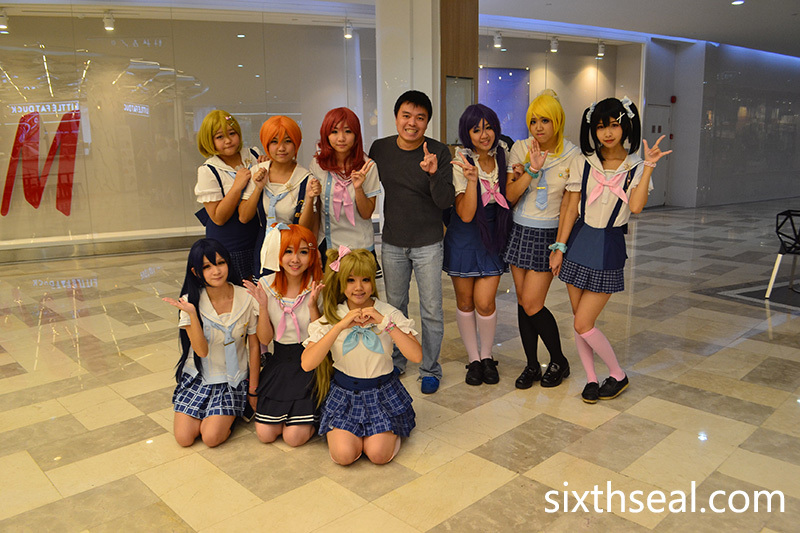 It was a really fun experience since I’m a huge fan of Love Live and it’s always nice to see a local group do so well. I have been trying to make more YouTube videos lately – this is my second one specifically for this purpose. My better half and a LLSIF friend told me the first one was ultra shaky and barely watchable and I took that feedback to heart. This time, I spent 12 times the amount of post-production work on the video. Well, it probably won’t take so long for a pro but I just installed Adobe Premiere CC a few days ago! I did learn a lot of things about video editing too, and I found out that I really like doing it. I like talking to people and getting good video and I like arranging the sequences to make a cohesive film. The music sequences in this one isn’t as good as I want coz I didn’t have a tripod with those swing/tilt/stabilize things. I’ll need to get one so next time I do something like this, I’ll have one static camera pointing at the stage (like how the music video is) on tripod while I actually hold the second camera. I did have a second one today but I couldn’t operate both. The idea is the static one is for wide screen whole stage shots while the one you’re holding (with stabilizer) goes for close ups. Thus, I can focus on the trio who’s currently singing and this will allow me to cut from the full stage shot to a close up. Also, in the interview segment I had a lot of trouble deciphering the words. That’s completely my fault coz I didn’t wire everyone up. I also didn’t have 9 microphone units but they’re actually quite cheap so I’ll definitely get some if I want to explore more on doing videos like this. When you record something with external sound, it gives you a lot of flexibility especially with B footage and the voice overs can even go on unrelated stuff, which I wish I did for editing ease. Also, my Chinese isn’t very good. I can understand conversational Mandarin but once you get to difficult words, I’ll be totally lost. I went to New Zealand at quite a young age to study and I didn’t learn Chinese in Malaysia anyway. I had to puzzle out the meaning via context (very useful) and a bit of guesswork so I hope the translations are somewhat accurate. I wanted translations and closed captions for YouTube coz the video is almost entirely in Chinese. YouTube is a very English-centric medium, unlike Nico Nico Douga or Youku so English subs are necessary. I want it when I watch the Love Live Sunshine radio dramas and skits anyway, wouldn’t be able to understand otherwise. Turn on CC if you want to read the English subs, I also spent a few hours writing them. I’m getting a lot better in many ways and even though I’m very frustrated at not being able to sleep (the insomnia is killing me) at least I’m learning new skills and doing stuff that I love. 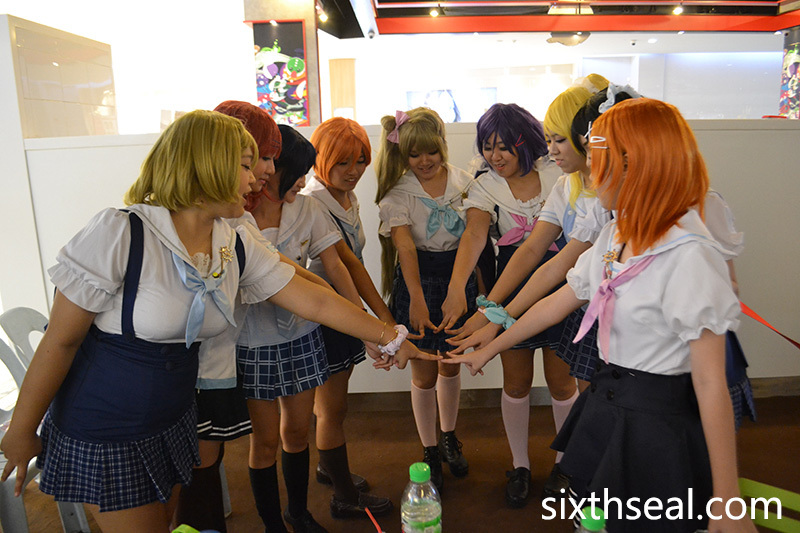 Thanks to Vicky and the rest of the MilkyWay cosplay group for letting me hang out with them today! It was a really interesting experience and I’ll see you all at the next event. I’ll be concentrating more on YouTube videos now so let me know what you think – feedback and criticism is always welcome. Cheers!